This adorable home is located in a very popular neighborhood just south of Inland Lakes Schools. The frame constructed home has an attached garage, a large kitchen, living room, full bath and utility room. The fenced backyard, including a fire pit area, is perfect for pets. The hard surface flooring extends throughout the home with 2 bedrooms carpeted. This may be the home you are looking for! Imagine 11 acres with 300 feet of frontage on a private lake, encompassed by 884 acres shared by just 24 owners, all of which is surrounded by thousands of acres of State Land. This high, dry parcel offers a building site shaded by old growth white pines, perfect for a walkout basement. Silver Lake is known for incredible fishing, restricted to electric motor only. Hunting privileges for members and their guests. Silver Lake is a gated community located about 15 minutes northeast of Indian River. 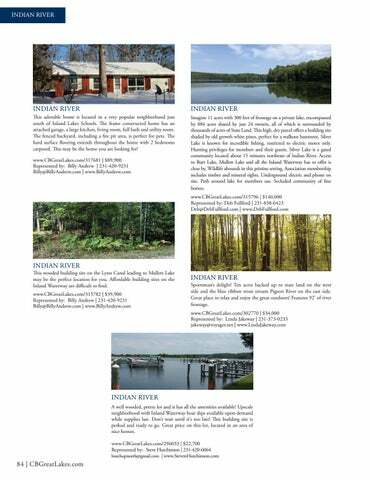 Access to Burt Lake, Mullett Lake and all the Inland Waterway has to offer is close by. Wildlife abounds in this pristine setting. Association membership includes timber and mineral rights. Underground electric and phone on site. Path around lake for members use. Secluded community of fine homes.